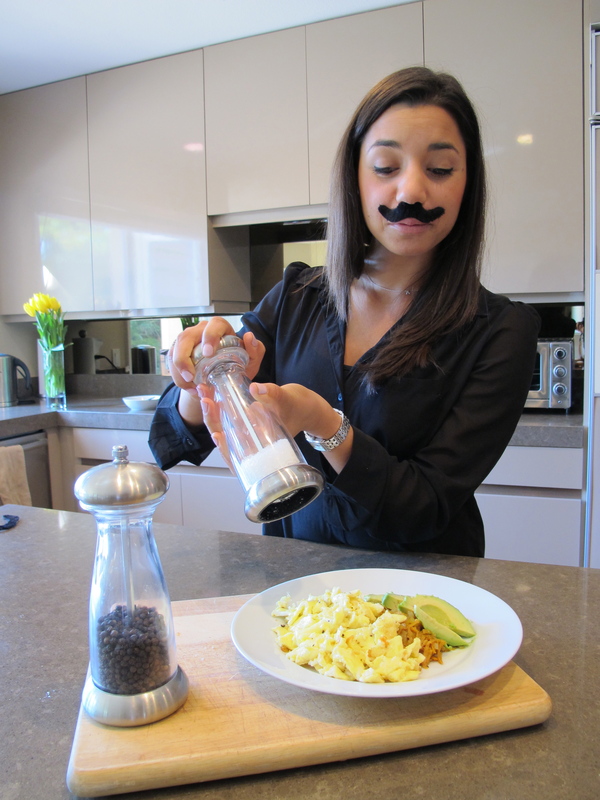 This post is in honor of Movember– a month dedicated to Men’s Health! Most men eat a breakfast comprised of carbohydrates and coffee. This is something that has to change! If you are a man reading this article and you want energy throughout the day, you need to get a jump-start with a power-breakfast. The ideal breakfast would consist of protein, healthy fats and some healthy (un-refined) carbohydrates. A balanced breakfast will provide you with the nutrients your brain and muscles need for a productive day. Check out this simple recipe that was designed just for you! In a separate pan, melt the remaining 1 Tbsp coconut oil (or organic butter). Pour in eggs and cook over medium heat until cooked through. Add your spinach to your eggs and stir often until fully wilted. Plate sweet potato hash on a plate and top with eggs. Slice up some avocado for the side OR top with goat cheese. Chef tip= Double the sweet potato hash recipe, cook it and leave some in the fridge for another quick breakfast. Next time you can heat up the hash and then you only have to cook the eggs.